K4413 X-Pod Cool Creatures Collection is a Make and Create collection released in 2005. 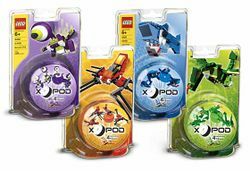 It contains the four X-Pod sets released in 2005, 4337 Dragon Pod, 4338 Monster Pod, 4339 Aqua Pod, and 4413 Arachno Pod. Facts about "K4413 X-Pod Cool Creatures Collection"